4th: China_Bronze Age - "Foster Art"
The pages in the Bronze Age section explore the Shang and Zhou arts, and how they reflect the learning goals stated above. Choose this path if you would like to explore the creation of Bronze, read a story, and explore an Ancient Chinese Bronze Workshop. Choose this path if you want to see Ancient Chinese Bronzes in a museum (challenging reading), look at them closely and take a short quiz about what you learned. Choose this path if you would like to look closely at designs in ancient Chinese Bronzes, and design a stylized face with symmetry. Click here to Read and Explore about bronzes. Have some fun and learn about the technology of "lost bronze casting" Click on the image! Read Here to find out about the Belief Systems of this Ancient Chinese culture. Can you find out anything about their resources? 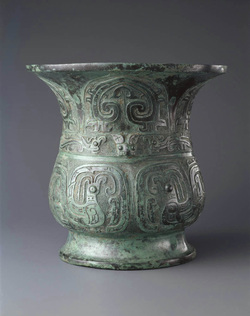 Scroll down to view a slideshow of Ancient Chinese Bronzes. Do the faces on the bronzes look realistic or simplified? What do you think are some reasons for this simplification?